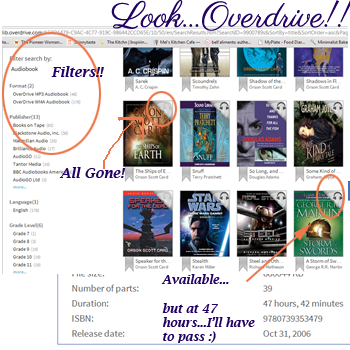 Reflections of a Bookaholic: Overdrive Update?! ... Yes Please! Overdrive Update?! ... Yes Please! Did this crazy amazing thing happen to everyone? One day, I go to browse overdrive to find more spiffy audiobooks to hoard and things look quite a bit different. I don't blink because, you know, these things happen. BUT... I soon realized that this wasn't just a beautification update where you think you've got something new and cool but you've really just have old things in new, hard to read colors. No. No. No. It turns out to be for real new. I'm EXCITED!! Psss... When I say Overdrive, I'm referring to an online media catalog that I can utilize through my local public library for free. 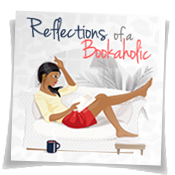 I check out both ebooks and audiobooks through this AWESOME resource. These are the things, I've already discovered that I love. 1. There are Filters. This is awesome! Essentially, you can now filter books by genre, media type, publisher, and grade level. Yes. Grade level. And yes, at times I care about the grade level of a particular books. I really really cared when I was teaching. Now, I only care sometimes. I think there are more filters but those are the only ones I care about right now. 2. There's a one step check out. When you click the button to borrow it results in you actually borrowing the book. I don't know how many times I thought I checked out a book in the past only to find that I only put it in my cart and didn't follow all the steps. This was especially sucky when I had been on a long waitlist for the book and I'd let my hold expire. 3. Visual status check. 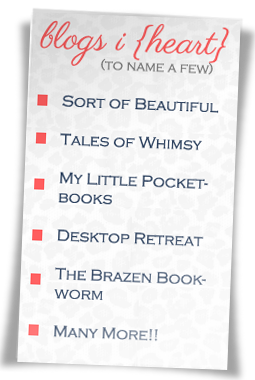 I love that you can tell whether or not a book is checked out by the little visual symbol at the top of the graphic. It was annoying to get excited about book after book only to click and find that it's checked out. Now, I can check the status before getting excited. I no longer will be clicking my way to disappointment. Bonus: The titles are even in alphabetical order. Crazy right? Overdrive was really annoying before these changes. They even have a handy dandy video about the changes, which I've included. I watched the whole thing (I'm that kind of nerd) so I thought some of you might find it exciting as well. So I have to ask again. Do you have overdrive? Did this change happen for everyone? I don't think my library allows me to request books that they should order but I'll have to look closer for that. I would LOVE that feature. It did for us at least. Oh, cool! 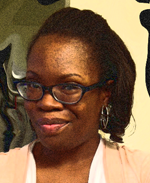 I was on Overdrive recently, but I guess the changes weren't there yet. I haven't been back because my library fines are over the $4 or $5 limit so Overdrive won't let me check out anything until I pay. LOL. Darn due dates. ;) Anyhow, I look forward to using the filters! I hope you get them soon. I gave up on the library bricks and mortar because of the late fees. I have a story about that. I won't get into that though. Realllllly? *gasp* I can't wait to go check mine out. Thank you for the heads up darling. I hope yours has changed. You just gave me something really neat to check out! Let me know if yours have changed. I just checked out my Overdrive and we haven't had the update yet. Hopefully we will soon because it looks a lot more user friendly. Ahhh that's disappointing. I hope yours changes soon. My library has overdrive, but I've never used it before. I just saw they had an ebook of In Darkness (That won the Printz) so I might try it out and see how it works. The "good" libraries with lots of books are a hike for me, so havint Overdrive is a plus. Oh you NEED to use it. It is very worth it. I'm so lazy. It is perfect for my life. I know, right?! I love the updates. I barely used Overdrive before, but I'll definitely be using more now that finding things is so much easier. I'm glad you have the updates too! I've used Overdrive for a few years now. I love it. It is one of my favorite book resources. It might be my favorite actually. I LOVE the audiobooks through overdrive. It is such an awesome feature. Shut up!!!!!! I can't believe I am just now seeing this. OK!! Wait! I have the Overdrive Media Console downloaded on my hard drive and there are only audiobooks there that I got from Audiosync.com And I have the Overdrive App on my iphone and ipad. There is a website??? What the ??? I had no idea. I am jumping over there right now. This is so cool. Where have I been? LOL! Thanks chica!